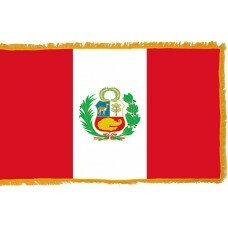 The Peru Flag consists of three vertical bands in the colors of red, white, and red. 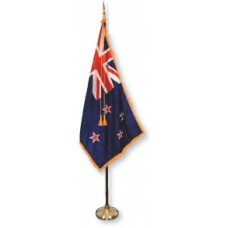 In the middle of the white band is the country's national coat of arms. The red colors represent the blood that was lost in the struggle for independence, the sacrifices made by those who fought and defended the country, as well as red being the color of the Incas. 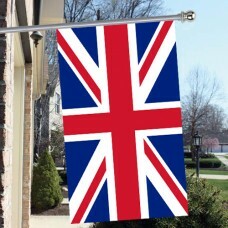 The white color represents the peace, the purity of the country, justice and freedom. The coast of arms (known as "Escudo De Armas" in Spanish) represents the country’s history, its geography and flora and fauna. The Coat of Arms features the Cinchona tree, which is a tree that is native to this part of South America, it features a gold cornucopia (ornament in the shape of a goat's horn) which has coins spilling from it and represents the country’s wealthy mineral resources. It also features a Vicuna, which is a South American animal that resembles a llama. The Peru Flag was designed by Jose de San Martin who led Peru to independence and was adopted on February 25th, 1823, making it one of the world's oldest flags. Peru is a country in South America that shares borders with Ecuador, Chile, Colombia, Bolivia, and Brazil. Its capital city is called Lima. Peru is a country that has been home to many empires and civilizations throughout history, including the Norte Chico Civilization, which is considered one of the oldest civilizations in the world and the Inca Empire. The Incas were an Indian Civilization who built a rich empire and ruled for over 100 years before the Spanish arrived in the nation. The Incas were very rich in gold and silver, which is what attracted the Spanish to Peru during the 1500s. In 1811, Jose de San Martin (designer of the national flag) began his fight in South America for independence, beginning with Buenos Aires. In 1817, however, he changed his army and led an army of 5,000 men through the Andes to invade Chile and gain independence. He followed this success by taking his army to Peru and declaring independence of the country in 1821. 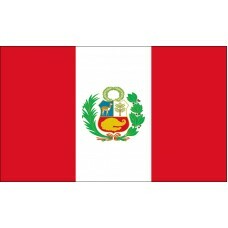 Peru celebrates Independence Day on July 28th and 29th each year and is known as "Fiestas Patrias" (Patriotic Holidays). Peru is a popular tourist destination, mainly due to the history of the country and the historic ruins and remains that can be visited, which include, buildings that were built by the Inca Empire which can be found in the town of Macchu Picchu and Cuzco. Tourists also choose to visit Peru to visit the Amazon rainforest (Peru is home to a great portion of the rainforest, after Brazil) and to climb the various mountain ranges, particularly the Andes mountains. A lot of the residents of Peru live in poor conditions and poverty, even though the country has one of the richest sources of silver and copper, as well as lead, in the world. may we always be so ,may we always be so! its lights, its lights...the sun! inherited from its Inca and Lord. Countrymen, may we see it a slave no more.